The Abbie sectional offers the ultimate curl up comfort. 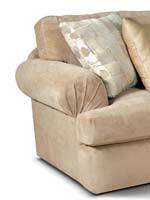 The seat cushions are deep and thick, while the backs are soft and plush. This sectional is great for enjoying a good book or watching your favorite team. Shown here with a right facing chaise left facing corner sofa, this versatile sectional is also available with a left facing chaise and right facing corner sofa. Complete your home with this comfortable and casual sofa. The Abbie Right Chaise Sectional Sofa with Large Cushions by England at EFO Furniture Outlet in the Dunmore, Scranton, Wilkes-Barre, NEPA, Bloomsburg, Pennsylvania area. Product availability may vary. Contact us for the most current availability on this product. 8250-05 RAF Chaise Lounge 1 42" 69" 38"
8250-64 LAF Corner Sofa 1 103" 40" 38"